Species often experience a genetic bottleneck that diminishes genetic variation after speciation or introduction into a new area. Though bottlenecks in population size always reduce fitness and evolutionary potential, introduced species often become invasive. This is known as the genetic paradox of invasion. 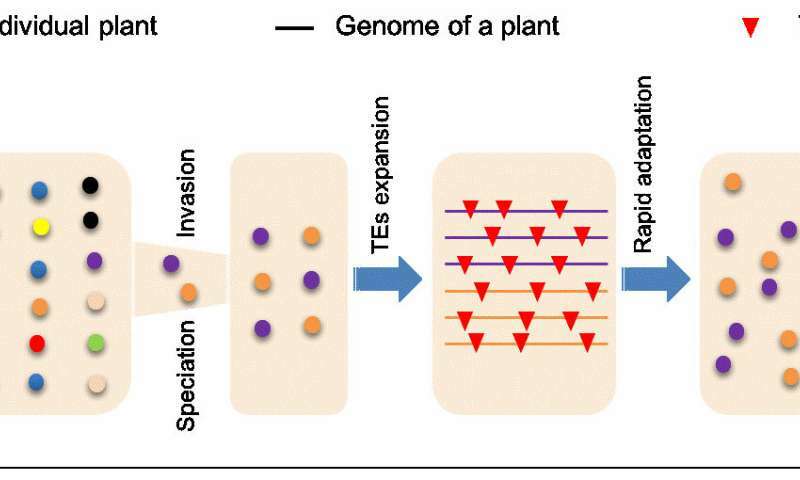 Now, a research group led by Prof. Guo Yalong from the Institute of Botany of the Chinese Academy of Sciences (IBCAS), together with SONG Ge, and Sureshkumar Balasubramanian from the School of Biological Sciences, Monash University, Australia, has revealed that transposable element (TE) insertions could potentially help species with limited genetic variation adapt to novel environments. To evaluate how TE insertions drive rapid phenotypic variation and help plants adapt to new environments, the researchers compared an annual and inbreeding forb (Brassicaceae), Capsella rubella, to its outcrossing sister species Capsella grandiflora. They found that transposable elements (TEs) are highly enriched in the gene promoter regions of C. rubella compared with its outcrossing sister species C. grandiflora. Interestingly, they found that a number of polymorphic TEs in C. rubella are associated with changes in gene expression, including TEs inserted into the FLOWERING LOCUS C gene, which is one of the key determinant genes of flowering time. Intriguingly, the accessions with TE insertion are early flowering and distributed in the southernmost habitat of this species, around the Mediterranean region. This region has a Mediterranean climate and is characterized by high precipitation, warm winters, and dry, hot summers. These results indicate that the genetic variation caused by the expansion of TEs can help species quickly adapt to new habitats. Its influence on adaptive traits could account for the genetic paradox of biological invasion to some extent. This study was published in PNAS on March 15 and was supported by the National Natural Science Foundation of China, the Strategic Priority Research Program of the Chinese Academy of Sciences, the Innovative Academy of Seed Design, the Chinese Academy of Sciences, the Chinese Academy of Sciences President's International Fellowship for Visiting Scientists, and the Monash University Larkins Fellowship.